New images of a "born-again" planetary nebula give a glimpse of what our sun might look like in 5 billion years when it transforms into stellar giant near the end of its life cycle. 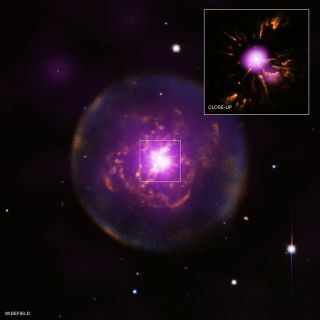 Scientists created the new stunning new view of the planetary nebula Abell 30 by combining visible-light images from the Hubble Space Telescope and X-ray observations from the European Space Agency's XMM-Newton and NASA's Chandra space telescopes. The Abell 30 nebula is located 5,500 light-years from Earth. The term "planetary nebula" is somewhat of a misnomer that dates back to the 18th century when astronomers thought these glowing blobs looked like distant gas giants. A planetary nebula is actually made up of the shells of stellar material ejected from dying stars that have passed through the red giant phase after starting to run out of fuel. About 12,500 years ago, a slow and dense stellar wind began stripping off the outer layers of the dying star at the heart of Abell 30, giving rise to the large, expanding sphere of gas seen in this image, with hydrogen represented in blue and oxygen in red. But the new images show that the star experienced a brief rebirth 850 years ago, violently spewing knots of helium and carbon-rich material and accelerating the stellar wind to its present speed of over 8.7 million miles per hour (14 million kph), according to the researchers. This fast wind caught up with the slower wind and clumps of previously ejected material, forming complex structures like the delicate comet-like tails and flower-like patterns seen near the central star in this image. Our sun may die out in similar fashion in a few billion years, swelling to a red giant that will engulf Mercury, Venus, and possibly Earth, before becoming a planetary nebula. The act will unleash a strong stellar wind and harsh radiation that will destroy any planets in our solar system that have managed to survive. The research is detailed in a recent edition of the Astrophysical Journal.